This Durable Demountable Bunk Bed Is Ideal For Residence Hall Use. It Can Be Stacked As A Bunk Bed Or Demounted Into Single Beds For The Ultimate Flexibility. Comes in Regular Or Extra Long. As one of the strongest, most durable metal bunks on the market, the Model 5000 bed can service your most demanding bunk bed needs. 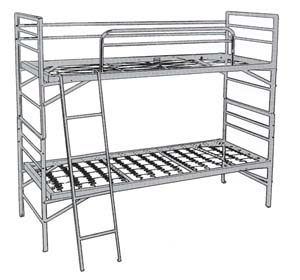 Heavy Duty Metal Bunk Bed with Steel Pan Surface. Bed End Construction Posts are 1-1/2 In. square x 18 gauge weld seam tubing. Commercial Grade Twin Over Full Metal Bunk Bed. Perfect for Camps, Dorms, Shelters and any other commercial purpose. The Platinum Twin/Full Bunk, like our other Platinum Bunk Bed. The 2.0 metal bunk bed loft give you the room you need in tight spaces like dorms or small lodge rooms. Single or Double Size Metal Institutional Beds. Easy To Assemble. Strong Metal Construction. Input from camp directors and resident managers went into the design of this metal bunk bed unit. Ideal for residence hall use as a single or bunk bed. No Spare Parts State of the Art Baked on Powder Finish Institutional Bunk Bed Quality.Weight Capacity: 350 Lbs Per Sleep Surface. Blantex army-style bunk-able beds let you maximize both space and comfort in your favorite bunk room. Strong Metal Army Style Bunk Bed. Fits Twin Size Mattress, Sold Separately.